The Ultimate Camping Supplies Checklist & Some of my Favorite Places to Camp! I know that camping out in the wilderness is definitely not everyone’s cup of tea, but if you do love camping as much as I do — you’ll love, love, love my new handy-dandy, Ultimate Camping Supplies Checklist! As my dad always told me while growing up, the key to success is to ALWAYS be prepared! This definitely counts when camping! 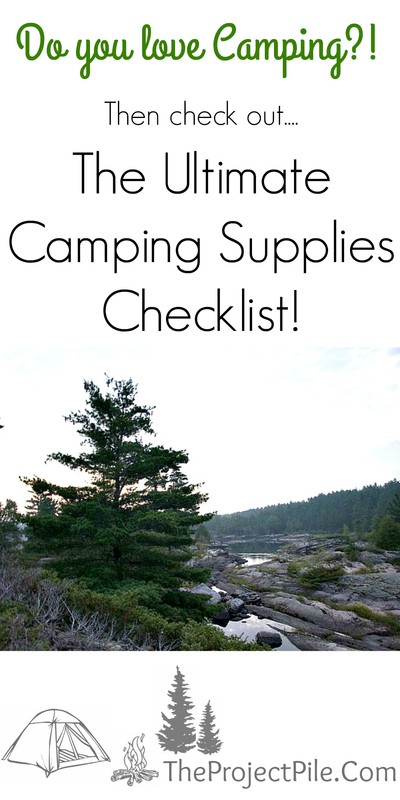 Whether you are camping in one of the many beautifully maintained provincial parks, or whether you are camping out in the middle of no-where in the bush, this checklist will make sure that you have everything that you need! Ontario luckily offers some of the most amazing campgrounds… Some with fees, and others are free! The French River Provincial Park is my most favorite place to camp (or be!) — ever! I’ve only been camping there twice… once for 4 days, and another time for ten days. Both trips were equally amazing! I love being out in the middle of nowhere, no one else is around and everything is so peaceful and quiet! The scenery is literally breath-taking, and if you are a bit of an adventure-junkie like me, this river boasts many fun rapids to play on! These rapids include the best of both worlds… rapids for the most experienced, to rapids for the least experienced! And don’t worry! Each rapid also includes a portage trail — for the slightly less adventurous! And one of my most memorable moments was laying on the rocks by the rapids gazing up at the stars! You’ll never get a clearer view then out there, in the middle of nowhere! We were even lucky enough to see a meteor shower!